UN Secretary-General Ban Ki-moon invited world leaders from government, business, and society to the UN Climate Summit 2014 to stimulate action on climate change. He asked them to bring big ideas and messages that could help reduce emissions, strengthen climate resilience, and mobilize political will to hopefully pave the way for a meaningful global agreement in 2015. I was deeply honored to be invited to speak about GIS and resilience last week at the UN Climate Summit 2014. Following is a summary of my talk there. Thank you your excellencies and prime ministers, ladies and gentlemen, guests. Thank you very much for allowing me to share a little bit about my work, and also the work that we are working on with the UNISDR, and a number of other organizations here. My field—my specialty, is in geography—geographic information systems, or sometimes referred to as GIS. Today this technology is advancing to become a kind of platform for analytics for the integration of multiple types of earth science and other data, and is used for visualizing, for planning, for modeling, for making better plans about everything that’s changing. It’s a very practical means of linking science with action, and it was used in Fukushima. It’s been used at a global level. It’s been used on literally hundreds of thousands of projects around the world. It supports this notion of risk assessment clearly, but also provides an information platform for making decisions about the future. I would dare say, creating the future. There are some hundreds of thousands of organizations currently using it around the planet for almost everything. But in the last few years, the technology has been changing—moving to the cloud and the web—so that it opens up access to the information and tools to virtually everyone. This is a dramatic change. 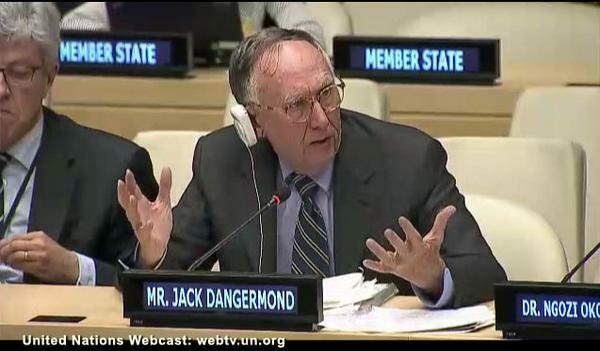 Jack Dangermond speaks at the UN Climate Summit on Sept. 23, 2014. You can see the video here (forward to 36:24). Starting last spring, the UNISDR and Esri, my organization, formed a collaboration, along with some others, to announce a challenge for entrepreneurs, young people, start-ups, and seasoned organizations to build apps on top of this new kind of geographic information system. And today, we’re announcing two winners. I’d like acknowledge these two winners. They’ve worked very hard. [Note: Updated information on the winners of the challenge is available here.] Today we’re also announcing a grant for software training and technology and information to 50 cities in developing countries. This is over five million dollars of resources that will be made available to help leverage geographic information and models in this space. We’re also creating a new marketplace where these apps and other apps will become a kind of new accelerator of invention, working on geographic-based solutions for different organizations in both the developed world and less developed world. I believe these will help create better understanding, and clearly, understanding should precede action.